so you can see what games they have played, as well as what trophies they've earned for each game. 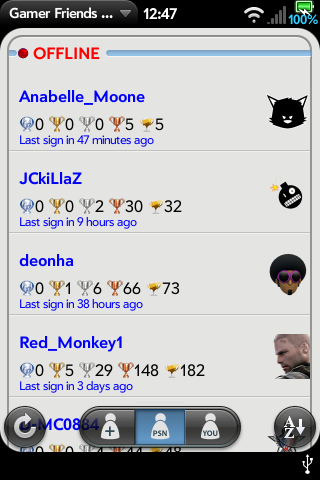 The app allows for you to cache your friends list & the numbers of trophies they have earned, so you can see it just by opening the app. 25% of the profits will go to either the USO or the Wounded Warrior Project from the total earned, each time Appstuh gets paid by Palm. 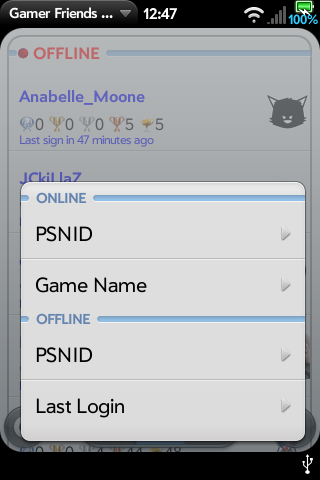 Note that your PSN credentials are stored on-devices unencrypted. The only place they go is from the app to Sony's servers. Also note that messaging through PSN is NOT possible at this time, as you can NOT send/receive messages through PlayStation.com. If they enable it, we will add it. If you need help, please tap the support link below. 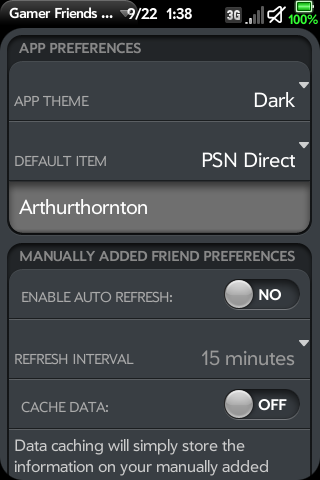 Gamer Friends for PSN is not related to Sony or PlayStation Network. It is neither endorsed by nor supported by Sony. Sony & PlayStation are trademarks of their respective owners.